Wyoming covers 97,818 square miles and has a population of 493,782 people. Wyoming’s capital is Cheyenne, which has a population of 53,011. Other important cities are Casper (pop. 49,644), Laramie (pop. 27,204), Gillette (pop. 19,646), Rock Springs (pop. 18,708), Sheridan (pop. 15,804), Green River (pop. 11,808), Evanston (pop. 11,507), Riverton (pop. 9,310) and Cody (pop. 8,835). 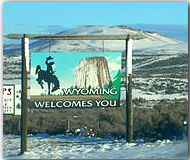 Wyoming was admitted to Statehood on July 10th, 1890 as the 44th state. It’s bordered by Montana to the north, South Dakota to the northeast, Nebraska to the southeast, Colorado to the south, Utah to the southwest, and Idaho to the east. The state flower is the “Indian Paintbrush” and it’s nickname is “Equality State”. Wyoming’s economy is broken into two categories; agriculture and industry. Cattle, sugar beets, sheep, hay and wheat provide for the agricultural side. While mining, chemical products, lumber and wood products, printing and publishing, machinery and tourism provide for the industrial side.